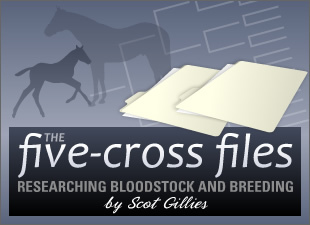 Sadly, every year makes it less likely that we -- in the U.S. -- will find true outcross stallions (i.e., a completely non-U.S. 5-cross pedigree). I'm all for clever patterns of inbreeding and building on tried-and-true bloodlines... but sooner or later, you've got to add new blood. Candy Ride (ARG) (pedigree) has Mr. P as his fourth sire. Invasor (ARG) (pedigree) has Nasrullah in the same position. Seattle Fitz (ARG) (pedigree) is closer to an outcross on his top side, with Donatello as his fifth sire -- but he has Seattle Slew as a broodmare sire and a completely American bottom line. In the U.S., if we want an outcross, we just about have to go with an Ahonoora (GB) (pedigree)-line stud -- and you won't find many in the Americas. You can send mares overseas to be bred to one of Ahonoora's sons... but even then, you find a sprinkling of several names common in American pedigrees in these stallions. And overseas stallions are rather inaccessible to the average breeder. So, readers, a challenge: find a Thoroughbred sire within the U.S. that is a near-perfect outcross for the standard Mr. Prospector / Northern Dancer / Seattle Slew lines. (Extra points for five-cross pedigrees free of In Reality... I love the line, but it's quite well represented in North American Thoroughbred pedigrees.) I'm even willing to accept The Jockey Club-registered Thoroughbred stallions that are used primarily for other disciplines (steeplechasing, sporthorse breeding, Quarter Horse sires). For the record, I'm going with French Seventyfive (pedigree) and Brazi (pedigree).